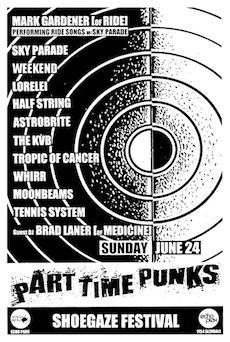 Sunday June 24, Part Time Punks will host L.A.’s first-ever music festival showcasing artists that defined, contributed to or were inspired by a short-lived sub-genre explosion of alternative rock dubbed “Shoegaze”. The general etymology and use of the word “Shoegaze” evokes eye-rolling, drunken debates and loads of cheerful nostalgia in equal measures — depending on who you ask, and most certainly how old you were when bands like RIDE, My Bloody Valentine and Lush were all radio playlist staples on both KROQ and KXLU (imagine that). No matter what your thoughts are on the genre and the always-debatable collection of bands that were lumped into this category, their influence has remained undoubtedly massive and far-reaching to this day, and that’s why this festival is necessary. Mark Gardener, formerly of UK noise-pop luminaries RIDE, headlines the day-long festival with L.A.’s own Sky Parade (who will also play their own set) as his backing band. Along with Gardener’s solo material, both acts will be playing a large amount of RIDE material in celebration of the band’s 20th anniversary of its sophomore release, Going Blank Again, but I bet you three Vaughn Oliver prints that we’ll probably hear some tracks from Nowhere too. UK bands dominated the conversation and press surrounding “Shoegaze” in the late-80’s and early 90’s, but here in the U.S. we had our very own shoegaze-inspired movements across the country. Lorelei were one of many acts on the incredibly deep Slumberland Records roster. They utilized noise and reverb to propel their own colorful brand of pop. While over in the western states, Half String and Astrobrite both helped to gain recognition for Arizona’s “Beautiful Noise” scene, and both bands have gained loyal followings to this day. Brad Laner, whose former band Medicine redefined noise and feedback within the pop format, will be spinning records throughout the night. It should be noted that the Captured Tracks label recently reissued a slew of Medicine and Half String material — essential listening for any fan remotely curious about each band’s discography. Rounding out the festival are five outstanding bands — new to most, unless you get your fix from relevant music blogs — that have incorporated the sounds and styles of shoegaze and made it their own: Weekend, Tropic of Cancer, Whirr, Moonbeams, Tennis System and UK synthgaze act The KVB. ready for this. i plan on going completely bonkers. fyi and all that.